Henry Marsh Watts was born on 20 March 1801 in Yeovil and his baptism on 19 April 1801 was recorded in the Yeovil Nonconformists' Register of Births. He was the son of Yeovil solicitor Samuel Watts the Younger and his wife Elizabeth née Marsh. Like his father and grandfather before him, Henry became a solicitor. On 22 September 1831 at St John's church Henry, at the age of 30, married 21-year-old Elizabeth Shorland (1810-1889), the daughter of Thomas Shorland (1778-1837) and Sarah née Spiller (1780-1812). Henry and Elizabeth were to have three children; Henry Shorland (1833-1889), Sidney (1834-1918) and Sarah Elizabeth, known as Bessie (1840-1923). Both sons would become solicitors and Sidney would become mayor of Yeovil. Bessie married industrialist GH Hebblethwaite and had nine surviving children. She died in Mirfield, Yorkshire. When his father moved to Bath around 1830, Henry took over the law firm and certainly in 1830, when he was aged 27, he was listed as an Attorney of Hendford in Pigot's Directory. The same directory also listed him as an agent for the Royal Exchange Fire Insurance Company. The listings were repeated in the Somerset Gazette Directory of 1840 (which used the old name of Cattle Market for today's Princes Street) and Hunt & Co's Directory of 1850. Slater's Directory of 1852 repeated the listings but referred to it as Princes Street. Henry's final trade directory listing was as a Solicitor of Princes Street in the Post Office Directory of 1866. This same directory also listed Henry's sons as solicitors - Henry in Ram Park and Sidney at Princes Street. In fact Henry owned Glenthorne House, Princes Street, opposite Old Sarum House. 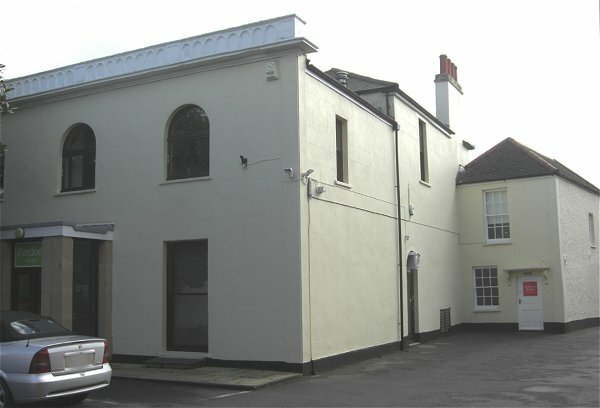 Both properties were attacked and damaged by the mob of hundreds of protesters in the Yeovil Reform Riot of Friday, 21 October 1831. In the Yeovil Poll Book of both 1832 and 1834 Henry was listed by virtue of owning a freehold house in Hendford and in 1837 HM Watts, Solicitor, was listed in a House of Commons Private Bill concerning Railway Subscription Projects, as an investor in the 'South Western, or Kingsworthy & West Monkton Railway', subscribing £1,500 (about £162,000 at today's value using the 'historic opportunity cost' of an investment project). The 1841 census showed Henry, listed as a solicitor, and Elizabeth living in Hendford with their three children; Henry aged eight, Sydney aged seven and four-month-old daughter Sarah. The 1846 poll book recorded that Henry's abode was in Roping-Path Lane in a freehold house and garden with a "freehold close of pasture ground called Coggan's Orchard". The 1851 census however clearly recorded Henry and his family, together with a cook and a housemaid, still living in Hendford. Henry was listed as an Attorney & Solicitor while his son Henry was listed as an Articled Clerk and Sidney was listed as a Writing Clerk. The 1846 Tithe Apportionment noted that Henry not only owned and occupied Glenthorne House (Parcel 31), he was also the owner and occupier of Bryndene (Parcel 264) immediately next door to Old Sarum House. Given its status, it is likely that Bryndene was his family home and Glenthorne House his law practice. Daniel Vickery, writing in 1856, noted "Mr H M Watts has an oak panel, representing Abraham offering up Isaac, which for many years adorned the kitchen of the Angel Inn. The Bank possesses the old figure which stood over the door". Both the panel and the life-size figure of the angel are now in the Community Heritage Access Centre, Artillery Road, and photographs of both may be seen here. The 1861 census shows the Watts family living in Princes Street, Henry now aged 60 was shown as a solicitor and Elizabeth was aged 57. Sidney, still unmarried and aged 27, had no occupation attributed to him although he too was a solicitor. Also living at home was Sarah now aged 24, a cook and a housemaid. The situation was almost identical in 1871 with the sole exception that Sarah had now left home. Sidney however now listed his profession as a solicitor. Henry Marsh Watts died on 19 November 1877 at Yeovil. He was aged 76. Henry was buried in Yeovil Cemetery (see below) with Elizabeth, who died in 1889. His will was proved in the following July and his personal estate was valued at "under £10,000" (but in excess of £12 million at today's value). His two sons, Henry and Sidney, carried on the family law firm. Glenthorne House, Princes Street, the home of Henry Marsh Watts and his family. Photographed in 2014. 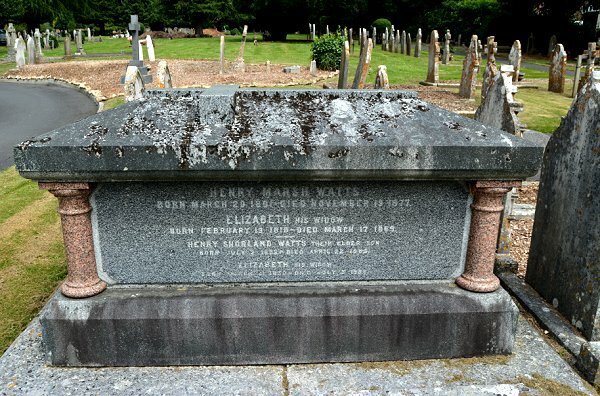 The table tomb marking the grave of Henry and Elizabeth in Yeovil Cemetery. Photographed in 2014.